RSBC IS THE PLACE WHERE THE WORD OF GOD IS TAUGHT! Please come out to Sunday School. It is an excellent way to increase your knowledge of God and enhance your relationship with God! Please consider a trip to bible study to improve your ability to apply God's word to your life. Please click on the Media Ministry Link to find out radio ministry tiimes for Pastor Johnnie Taylor and Minister Jamie Galloway! Rising Star is a growing congregation of Spirit filled believers in search of the perfect will of God. It is our desire to carry out the Great Commission and we have a strong committment to teach and learn God's word for application in life. The end times are here and we desire to see as many people saved as possible. Come join us here as we grow in grace and continue to be transformed into the image of Christ. On any given Sunday, there is an opportunity to experience traditional, and contemporary singing incorporated into a rich worhsip experience that helps to develop the spiritual condition of God's people. The Focus of the Ministry is to equip and train God's people according to the instructions of (Ephesians 4:11-13) and fulfill the great commission according to (Matthew 28:19). We sincerely hope you enjoy your visit to our site and that you will plan to join us soon for worship! Copyright © 2017. 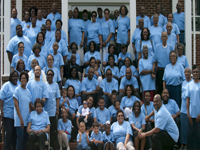 Rising Star Baptist Church Inc. .All Rights Reserved.